The survey drawing is overlaid with preliminary designs in pencil for a projecting segmental bay window at the centre of the north front, rounded ends in one of the north-facing rooms, and an additional stairwell in the east court. 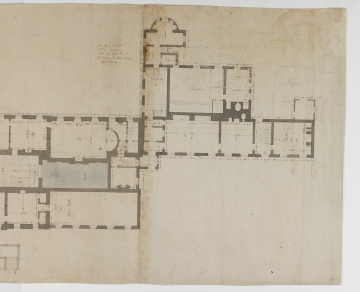 The plan, as well as Soane's rough section, shows a preliminary design for building a top-lit drawing room in place of the existing common staircase and cluster of subsidiary rooms. Soane's design already considers the room's finishings, specifying fluted Corinthian columns to support the pendentive-domed ceiling. The room is lit by large windows facing north ('windows to floor' indicated on section) and a lantern raised on pendentives. As Ptolemy Dean has noted, the section shows how high the lantern needs to be raised in order to clear the surrounding roof tops. On the morning of 10 June 1790, Soane and Guibert visited Wimpole and took plans of the house, probably resulting in this survey drawing and drawings 1 to 3 (Journal No 1). Guibert's identity is unknown. According to David Adshead ('Wimpole Architectural Drawings', p.69), the Earl of Hardwicke's account book records that on 12 June 1790 the estate carpenter provided 'Mr. Soam [sic] and his Man the Measures of the House'.